Roving Light TravelPhotoBlog: Early Christmas Gift! Please note that these images for download are granted for PERSONAL USE only. They are NOT for resale or commercial use. Thanks! Download the image files here. There are six 8x10 images which you can print either using your own home printer, or you can send it to your favourite lab. Sending it to the lab is probably more expensive, but printing on your own, you may need to adjust the colors if they don't come out right. For paper, I think thick matte paper is best. Each 8x10 print consists of two square images. Cut them out so that you'll have 12 square prints for 12 months. 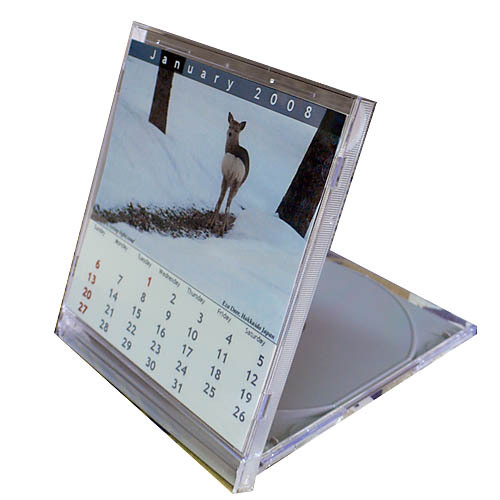 If you're printing it at home, note that the image properties is set to 150dpi, and if you just follow that, you'll end up with 4.75in (12cm) square prints which fits right into a CD case. Get a CD jewel case. Remove the jewel case cover gently, reverse it, and connect it back. Becareful not to break the "tooth" that clips the cover in place. Insert the prints as appropriate and there you have it!